So, you might be thinking that it's all work, work work... Wrong. Actually, it's work, work, work, play, work, work, play, work, work, play, work, play, play. For example, Tuesday afternoon was the monthly Friendship Luncheon held at the Purple Toucan. Well attended as usual by over 20 Expats and visitors. Lynn and Pete French are another example, sort of in-be-tweeners. They own property here, but don't live here yet. They also attended the luncheon and Lynn took the shot below. Then, by golly, it's more work, work, work. Oh, yes. Then we had to go to Colleen's house Friday evening for cocktails. She's quite the character, having lived here in Corozal for better than 15 years. She knows the dirt on everybody. 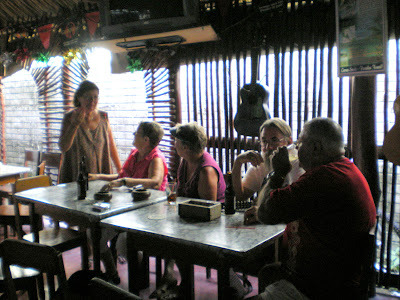 Well, not really, but she does have interesting stories about some of the folks both locals and Expats. In addition to the memorabilia, Colleen has some amazing art work - her dining room table for example. It's built from local woods, and the base is a stump. But what a stump. Full of hand-carved figurines of Belizean animals. The carving was done by a local wood carver named Papi. He was quite well known in his day as being one of the finest wood carvers in all of Belize. Unfortunately, demon rum got to him and his hands began to shake so much he had to give up carving. A true loss to Belizean culture. I still see Papi every day. He and one of his daughters ride their bicycles past our house over to one of the houses on Gringo Lane that they house-sit for the absent owners. I have never talked to him, but we wave hello to each other every time. I'll have to make it a point to ask him to stop and talk, and tell him I've seen the table and his excellent carvings. Maybe he'll let me take his picture for the blog. We'll see. We capped off the evening, after the cocktails, by going en-masse to RD's Restaurant, one of Corozal's newest and better restaurants. We had such an enjoyable time there, the owner even took a group photo for his Wall of Fame album in the restaurant. You might be interested to know that Jim Voris (the distinguished gent with the white hat) is a genuine published science fiction author, having written and published two books - The Waters - Book 1 - The Valley, and The Waters - Book 2 - Contact (both available at http://www.lulu.com). Jim is currently working on the third installment of the series. He's gracious enough to put up with my interruptions when he's working on his PC. Of course, then it's back to work, work, work, and more work. Here's a couple of shots of our back or streetside stairs and the new railings. I think they're shaping up quite nicely. They'll look especially good after they get a couple of coats of varnish on them. Naturally, it can't be all work, work, work. Sometimes, you have to stop and smell the roses, or at least watch the ants at work. This morning, I watched quite a few of them as they dismantled a dead bug of some sort. The orange extension cord in the upper left gives some idea of the scale. This morning, Dianna and I went to several places looking for fans and lights for the house. Of course, some things are hard to come by out here in the hinterlands. We did buy a can light for the bathroom shower, and probably will get the fans Monday morning. I think for the kitchen lights and those for the bathroom that we'll have to at least go to Orange Walk or maybe even Belize City. On the way back, we took advantage of Corozal's fast food eateries - roadside BBQ stands. Our favorite is on the Northern Highway, just across the street from Lano's Supply. They offer BBQ chicken or pork, with baked beans and coleslaw, all for $6.00BZ each. It's really finger licking good. The Colonel can bugger off. This has him beat by a mile. Since I mentioned Lano's Supply, we had gone there looking for lights. We may have found a few that will work nicely. I also found a deep sink for the utility room, and probably a kitchen sink as well. Dianna and I had a nice talk with Lano, the Chinese owner of the store. We talked a little about differences and similarities between China and the US, the hardware business, and one of his children, who is in university in New York. And then, this evening, it was off to another party. This time a birthday celebration for Jenni. She was nice enough to provide food for all of us attending. Her husband, Nigel even arranged to have Brad and Christina provide some music for the festivities. BTW, Brad and Christina are newly weds - after 20-some years... Congratulations! Brad teaches music at one of the local schools here in the area, sometimes assisted by Christina. Brad eventually took bit of a break and played percussion while Jerry Lee - er, excuse me, that's not Jerry Lee - it's Nigel on keyboards! They made a very entertaining trio for the evening. Even if Nigel did want to play Deep Purple's Smoke on the Water. More shots of the entertainers at work. Somehow, Brad and Christina found time to help the rest of us put away some delicious rice and chili along with some fine homemade bread and deserts brought be some of the attendees. So, it just goes to show you, that life down here is just one continual trial of drudgery, toil, and work, work, work. I mean, you've seen the photographic evidence. I ask you, just how much fun could these people be having? oh,yes,we had fun! I wanted everyone who contributed to my party to know how much they were appreciated!! Thanks all! !